Windows 10 Build 14316 has been released to Insiders on the Fast ring. Lots of new features in this build. • We fixed the issue where on some PCs with TPM chips, such as the ASUS Zenbook UX31, you may have experienced glitchy audio and jumpy movement when using the trackpad due to the “tpm-maintenance” task running constantly in the background instead of once per boot-up like it should. • We fixed the issue where if you use Hyper-V and have a Virtual Switch configured for your network adapter, you might see an error indicator (red-colored “X”) for your network adapter in the notification area of your taskbar. • We polished the Wi-Fi flyout UI and fixed an issue where text entry into a Wi-Fi password field was noticeably top-aligned rather than centered. • We fixed an issue for where when using multiple monitors and full-screen apps like PowerPoint or Remote Desktop would crash Windows Explorer. • We fixed an issue where Cortana wasn’t showing Settings pages in the search results. • We have updated the Windows Update notification after updates have been installed so now clicking on the notification will take you straight to your update history. 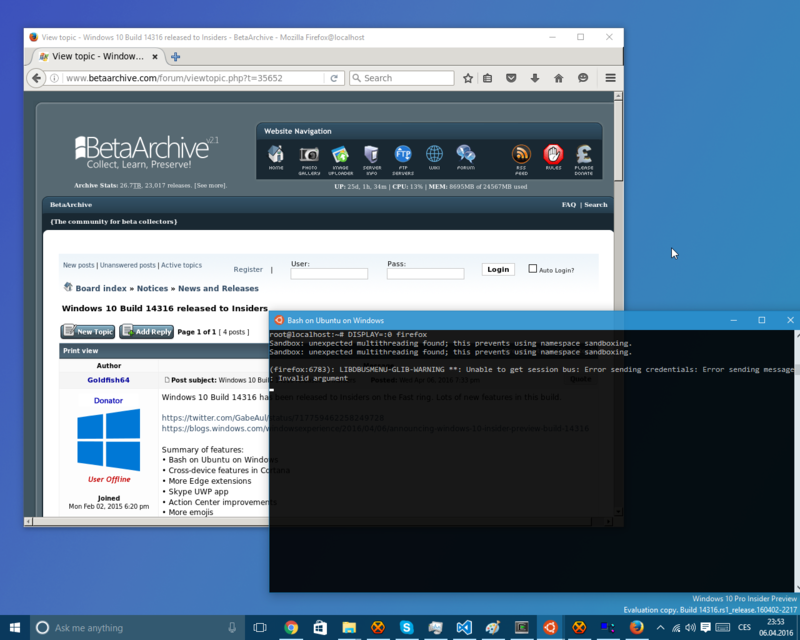 • We fixed an issue where desktop (Win32) apps pinned to the Start menu would sometimes move after updating to a new build. • We fixed an issue where “Update and Restart” and “Update and Shut Down” wouldn’t start an update. • The Visual Studio emulator for Windows 10 Mobile and Hololens will fail with “An authentication error has occurred. The Local Security Authority cannot be contacted”. If you are a developer and require the emulator for building apps, we suggesting moving to the Slow ring and skipping this build until we can fix this issue. • We continue to investigate issues with Narrator and other screen reader apps that make them unable to read selected text in the Feedback Hub, Cortana, and other apps. • In Microsoft Edge, some large downloads may appear to get stuck at 99% completion. You can work around this issue by renaming the file in your downloads after closing Microsoft Edge. This workaround skips security checks on the file, so it should be used only with files from a trusted source. • In some cases, attempting to turn on Developer Mode on may crash the Settings app. If this happens, the workaround is to use these steps here to enable Developer Mode. • Some apps notifications may only show the icon – however the full text of the notification will be visible within Action Center. Damn this build sounds nice. Dark theme and finally a better Skype app, as well as Bash. I'm tempted to upgrade all my devices to this, including my main-use ones if it runs stable enough whilst testing. None of the bugs are problems for me. Any users with a KryoFlux in the UK: if you could dump some floppies if I send them to you, that'd be awesome. PM me. Too bad there is a cellular bug that's preventing the mobile build from being seeded. Ahh. ESDs are being uploaded to BA as we speak. Given the development stage of the WSL I am not even surprised Firefox crashes on every other website. I think if CMD, Powershell, and Bash were merged that would be the ultimate Command line. All hail the almighty PRIUS!!! How did you get Firefox loading if you don't mind me asking? I'm surprised by how functional the Linux subsystem is. I just attempted and was able to compile a kernel with no issues. 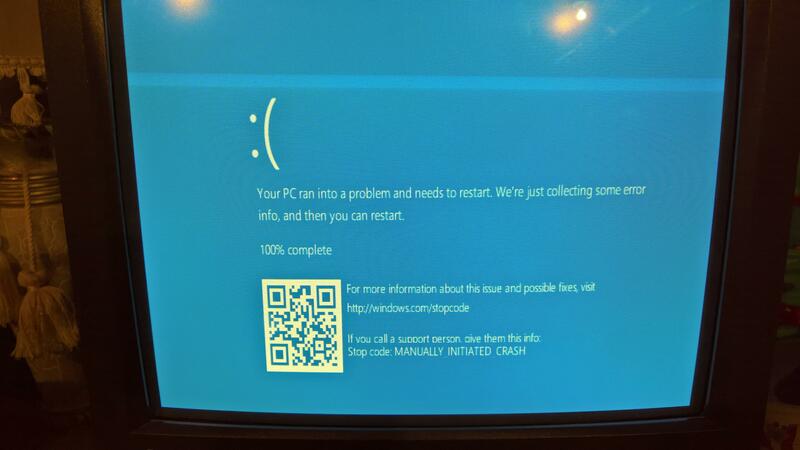 Found a new feature of the BSOD in 14316: a QR code! Like you would actually have time to pull out you phone, open the QR app, and scan the on-screen code before the system reboots. Honestly, I would rather see the actual error info instead of that big, useless QR code. 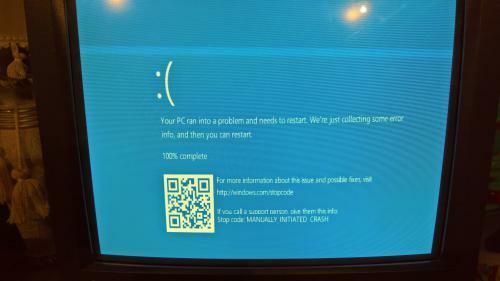 It would be a bit more useful if the system weren't set to reboot when a BSoD occurs by default. With these settings, all the user sees is a giant square that shows up for 5 seconds. Mostly it happens for only a second or two. It seems that WSL is 64bit only. in 14316 x86 build I can't find this entry for turn on/off. I really hate how companies force everyone to do everything with their smartphone. They aren't really forcing anyone though, it's just a more convenient way of looking up the issue. You can always just write down the actual stop code. Last edited by Fuzzy_Blanket on Fri Apr 08, 2016 12:13 pm, edited 1 time in total. True. Perhaps Microsoft is going to disable that by default and then have some sort of message instructing the user to restart either with a key press or hard rebooting the machine. I'd most likely bet against it, especially on servers. However, this could be implemented on client systems. I'd love to know that too. I assume that the linux subsystem does not include an X server, so I checked whether linux applications could use CygWin/X, but to no avail. AlphaBeta, will you share your secrets with us? I personally use Cygwin/X, although others should work as well - the only thing really required is that it is able to render stuff and allows remote clients to connect over TCP. 0) Install Cygwin and the X server. This starts an Cygwin/X server on displaynumber 0 listening for incoming connections over TCP. The multiwindow option provides an integrated window manager to show the windows with a native Windows window frame. 3) Run your favorite GUI goodies, as long as they don't use stuff not implemented as of yet. @4512jth: I used the regular Firefox from the repo. I think this is what I was missing. Yes, it works now! Actually it fails, but it's still great that some windows open! is the Taskbar bug common or rare?